(3) the treatment of Poland and the other liberated countries. It was during this conference that Roosevelt saw a significant decrease in his health. Upon his return to the United States, he soon became very ill and died in April. The agreement was drafted by Sir Gladwyn Jebb, representing Great Britain, Andrei Gromyko, representing the Soviet Union, and Alger Hiss, representing the United States. Areas agreed to by FDR at Yalta and Teheran for Soviet dominion facilitated by Lend-lease aid; the white areas constitute the "Free World." The United Nations plan, which had been agreed to in principle by Soviet Union long before, was no longer an issue. There was the question of voting to be settled and this was done without any difficulty by agreeing in full to Stalin's desires. The formal proposal to hand over eastern Poland east of the Curzon line was made by Roosevelt himself. In western Poland, Stalin already had a government there representing no one but Stalin. FDR agreed, however, that this provisional government should be "reorganized" to include "democratic leaders from Poles abroad." Stalin agreed to hold an election, which he said "he could do in a month." The election was not held for 23 months and Poland ended with nothing but Communists in the government  of a country where they did not represent 10 per cent of the people, while the other elements fled Poland for their lives. To compensate Poland it was agreed to give Poland a part of East Prussia, a totally German land. 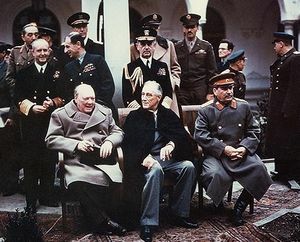 The Yalta conference was, as it has come to be known in Poland, Eastern Europe, China, and much of the world, the Western betrayal of democratic allies who had fought for the principals of self-determination. The main agreement of the conference regarded the decision for an unconditional surrender of the Nazis. They agreed to divide Germany into four occupation zones, with Berlin itself further divided into zones. They also agreed that free elections would be held in Soviet controlled Eastern Europe, but Stalin never had any intention of fulfilling this promise. The USSR also agreed to take part in the war against Japan, though they played a negligible role. Roosevelt agreed that the Kurile Islands would be handed to Russia, as well as southern Sakhalin Island, internationalization of the Port of Dairen (Dalian), the lease of Port Arthur (Lushun) as a naval base and joint operation of the Chinese Eastern Railway and South Manchuria Railway. On the eve of Yalta conference the Japanese Foreign Minister asked the Russian Ambassador in Tokyo about the possibility of arranging for a settlement. Stalin did not communicate this to either Roosevelt or Churchill. The Yalta Betrayal, Felix Wittmer, Claxton Printers, 1953. ↑ While You Slept: Our Tragedy in Asia and Who Made It, John T. Flynn, New York: The Devin-Adair Company, 1951, pg. 148 pdf. ↑ Speaking Frankly, James F. Byrnes, New York: Harper & Bros., 1947, p. 29. ↑ Speaking Frankly, Byrnes, op.cit., p. 32. ↑ Byrnes, op.cit., p. 32. pg. 43. ↑ While You Slept John T. Flynn, pg. 168 pdf. ↑ Saturday Evening Post, Editorial, April 11, 1953, pg. 12. ↑ Report to Congress by President Franklin D. Roosevelt On the Crimea Conference, March 1, 1945. ↑ New Republic, February 19, 1945, p. 243. ↑ Repatriation — The Dark Side of World War II, Part 3 by Jacob G. Hornberger, April 1995. Retrieved from the Future of Freedom Foundation, August 21, 2007. ↑ Andrei Andreyevich Vlasov, from Alexander Solzhenitsyn, The Gulag Archipeligo, v.i, p. 252, fn. 8. This page was last modified on 4 January 2019, at 03:11. This page has been accessed 29,521 times.